YANGON—The withdrawal of EU trade preferences would impact the lives of ordinary people, putting more than 400,000 jobs at risk in the fast-growing garment sector, which is the country’s largest foreign income earner, lawmakers, labor policy makers and rights groups warn. The EU Trade Commissioner announced on Oct. 5 that the bloc was considering withdrawing Myanmar’s preferential trade status due to human rights violations against the Rohingya in Rakhine State. “The action will affect ordinary people and the families who rely on them,” U Maung Maung, the president of the Confederation of Trade Unions in Myanmar (CTUM), told The Irrawaddy. CTUM recently published an open letter to the EU strongly opposing the withdrawal of trade preferences and pointing out that the move would only harm the country’s social development as it undergoes a transition to democracy. Malmstrom said the European Commission and the European External Action Service would notify the Myanmar authorities that it would send an emergency, high-level EU mission to the country in the coming days to assess the situation on the ground. Myanmar is not the only country under threat of losing privileged access to the European market. Earlier this month, Malmstrom announced that Cambodia’s access to the EBA scheme was under review in response to a finding by Brussels that the elections in the country earlier this year were unfair and that voters’ rights had been abused. A part of the EU’s Generalized System of Preferences (GSP), the EBA scheme grants full duty-free and quota-free access to the EU’s single market for all products except arms and armaments. To qualify, a country must be listed as a Least Developed Country (LDC) by the UN Committee for Development Policy. Since 2013, the EU has lifted duties on goods from Myanmar under the EBA’s zero-tariff import regime. This has helped Myanmar attract foreign investment and become a major support for its economic boom centering on the garment sector. Nearly 70 percent of Myanmar’s exports go to EU countries, and more than half of these are garments. According to the Myanmar Garment Manufacturers Association (MGMA), as of 2014 Myanmar’s garment sector was booming, with both foreign- and locally-owned factories exporting to the European and U.S. markets. The EU is Myanmar’s largest trade partner for garments, purchasing more than 47 percent of the products, while Japan, the second-largest, purchased just 27 percent of garment products in 2017. Myanmar exported $1.2 billion worth of garments in 2013, $1.5 billion in 2014, $1.7 billion in 2015, $2.1 billion in 2016 and $2.7 billion in 2017, according to the MGMA. Garments account for 71 percent of overall exports to the EU, fisheries products 8 percent, rice 4 percent, beans 4 percent, precious stones 8 percent and wood products 5 percent. According to MGMA, the garment sector has become the most labor intensive of Myanmar’s major industries since the opening of the EU market, with the number of factory workers growing from 240,000 in 2012 to 450,000 currently. 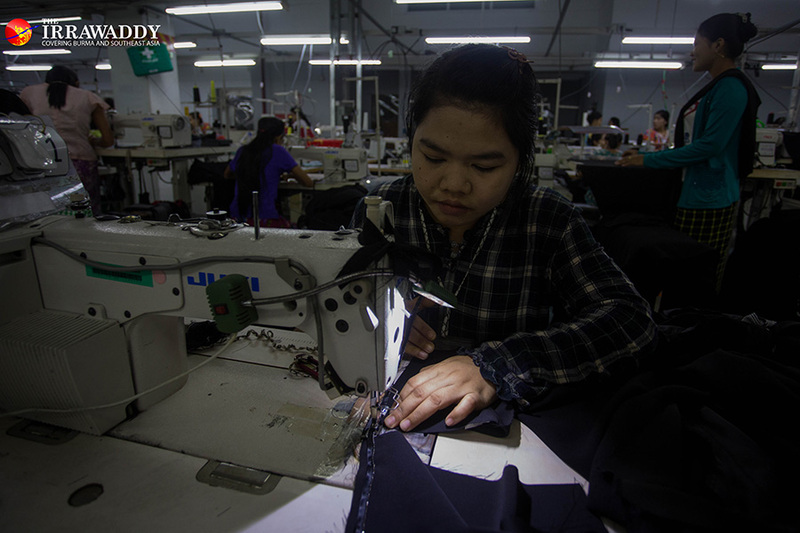 According to CTUM, however, there are more than 500,000 garment workers in Myanmar, of whom at least 400,000 work in factories that mainly export to the EU. As of Sept. 30, 2018, according to the MGMA’s records, there were 518 factories in Yangon, Thilawa, Pathein, Hpa-An and Mandalay, supplying European and other international brands like H&M, Inditex, Next, Adidas, Primark and Gap. Yangon is home to about 200 garment factories. “The garment sector is an incredibly powerful generator of livelihoods and opportunity for hundreds of thousands of families in Myanmar,” the MGMA said. Lawmaker Daw Pyone Kay Thi Naing, a member of the Lower House International Relations Committee, told The Irrawaddy the government is doing its best to solve the Rakhine crisis. The lawmaker said the EU should consider the fact that over 400,000 people, mostly women, would be affected by sanctions—more than half the number of people who fled from Rakhine State into Bangladesh. “I see no connection between those women and human rights abuse accusations in Rakhine State. If those grassroots women become jobless due to the EU sanctions, it’s a kind of war crime,” she said. Lawmakers said withdrawal of trade preferences is not the right way to apply pressure over human rights violations against the Rohingya in Rakhine State, as they would also disrupt the government’s major economic reforms, which have seen the country open up after more than six decades of isolation under military dictatorship. “It is the wrong button. Trade sanctions are not the right way to apply pressure over human rights violations in Rakhine State. They would only send the civilian government into another crisis,” Daw Zin Mar Aung, a Lower House lawmaker, told The Irrawaddy. “The EU should think about who will suffer as a result of removing trade preferences. Their approach should be positive, whether the government has committed human rights violations or is trying to make conditions better,” she said. Lawmakers said that while the government rejected the UN fact-finding report, it did set up its own commission of inquiry to investigate human rights violations in Rakhine State. Moreover, it has been implementing the recommendations in the report by the Advisory Commission on Rakhine State chaired by the late Kofi Annan. In April, the EU extended and strengthened the EU’s arms embargo on Myanmar and prohibited the provision of military training to and cooperation with Myanmar. In June, the EU imposed sanctions against seven senior military, border guard and police officials who it said were responsible for or associated with serious human rights violations against the Rohingya population in 2017. The sanctions comprise an asset freeze and a travel ban. Rights groups have urged the EU to impose targeted sanctions against the Burmese military and its leadership, who according to a recent UN investigation are responsible for crimes against humanity, war crimes and perhaps even genocide. The Irrawaddy asked Kinga Malinowska, the European Commission’s press officer for trade issues, about the review period and the process of withdrawing Myanmar from the EBA. However, the spokesperson simply referred to the statement by the trade commissioner, and would not answer any further questions. Policy makers from trade unions said the withdrawal process takes about six months, adding that they would negotiate as best as they can to persuade the EU not to withdraw the trade preferences. “The EU should not only listen to the one-sided lobbyists; they should also listen to our voices. We will let them know that [ending the EBA is] the wrong goal,” said U Maung Maung, the CTUM president.